With the end of the school year fast approaching, it doesn’t take much for the Mums to find an excuse to get together for a coffee and a natter. What better reason can there be but to raise money for a good cause while you are enjoying yourself? 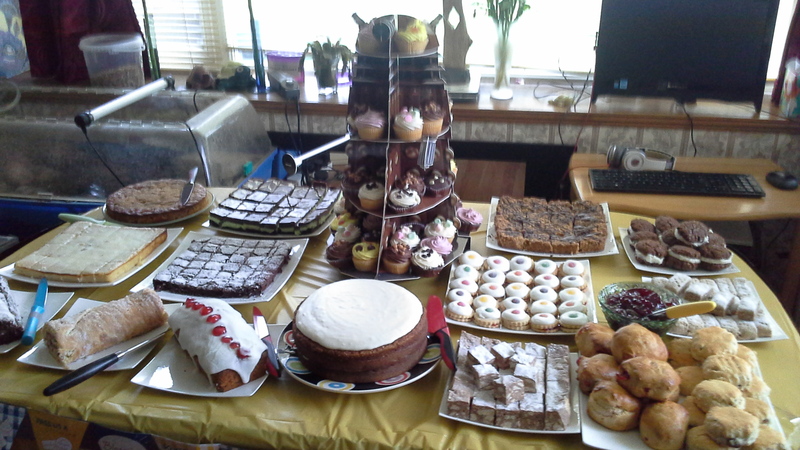 The Marie Curie Tea Party seemed a great reason to get together and do some good at he same time. I have so much respect for the nurses of Marie Curie. They do a very difficult job, almost unnoticed by the greater society, and yet without them life would be so much harder for so many people. My Dad died from cancer in 1996. He went from being up and about to being literally on death’s door in a very short space of time, so while hospice care was suggested, there was not time to organise it, and so we had nightly visits from the wonderful Marie Curie nurses. They not only made him as comfortable as possible, making his last days as gentle as possible for him, but they counselled my mother at a time her whole world was crashing down around her. They took away the pressure on her, and gave her some peace to remember my Dad. I will always remember with fondness the ladies who visited us at that time. Having said all that I truly hope never to have to need them again! When the idea of the tea party was thrown out to my circle, one friend said that if it involved coffee and I was baking she would be there, and this was the attitude of many others. I therefore spent a couple of days making everyone’s favourites, from flapjack and swiss rolls, to cupcakes and empire biscuits. There was a very full table! We had a rolling succession of friends, and their friends coming in through the morning and lots of gossiping, coffee drinking and cake eating took place. Everyone left with a box full of cakes for later too! After school, several people sent their kids in with a coin to get something nice for their pudding! Other people who couldn’t make the event, asked for boxes of cakes, which I happily handed out the following day. We also had a little competition during the morning, where everyone that came had to make a guess as to the number of layers in the worlds largest cake. The winner, who guessed closest was the great-grandmother of one of D’s school chums, and she won a mug and coaster set. The answer if you are interested is apparently 220! In total we raised £85 which with gift aid, came to £106 for the charity. I am really impressed what can be done when you get together with a few friends and have a nice morning, and to be honest not really try too hard! Our next excuse for a get together will be the MacMillan coffee morning in September, but I am sure we will fit in some coffee for the sake of drinking coffee before then. Thank you everyone who took part. Reblogged this on ASD Mummy with issues..